Depart Tel Aviv and enjoy the coastal plain on your way to Caesarea,capital of Judea under the Romans. (In AD 6 Judea became part of a larger Roman province, called Iudaea, which was formed by combining Judea proper (biblical Judah) with Samaria and Idumea, biblical Edom). Visit the amazing excavations of the ancient city, the Roman theater and aqueduct, where Paul made his defense before Festus and King Agrippa prior to his final journey to Rome. Proceed to Muhraka, the site of confrontation between Elijah and the prophets of Baal; enjoy the spectacular view of the Jezreel valley and the lower Galilee . Our journey continues to Megiddo, identified as the site of Armageddon. Visit the archaeological excavations including the well-preserved water supply system. 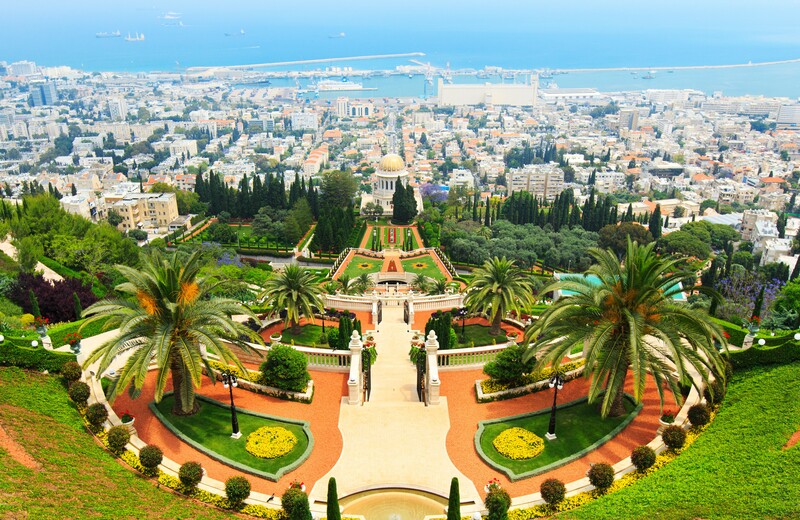 Drive to Acre ato visit the remarkable underground Crusader City and crypt; walk through the Old City recognized by UNESCO as world heritage site , the local market and harbor. Continue to Kibbutz Lavi for dinner and overnight. 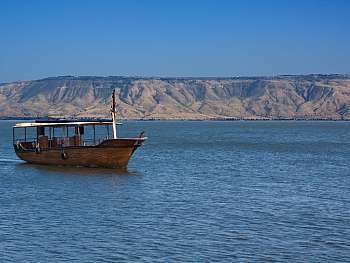 After a short tour of the Kibbutz grounds you will enjoy a boat ride across the Sea of Galilee to Capernaum, where it is believed to have been Jesus’ home. Visit the remains of the 2nd century synagogue. Proceed to Tabgha, the traditional site of the miracle of the multiplication of the loaves and fishes and the fourth resurrection appearance of Jesus in Christianity. Visit the Church of Multiplication with its 4th century mosaic floor. Continue to the Mount of the Beatitudes, where Jesus delivered the Sermon on the Mount. Drive to the Banias Spring and Waterfall, where Jesus was recognized as The Messiah by His Disciples. Tour the Golan Heights, with its beautiful valleys, captivating grazing land and snow capped mountains. Return to Kibbutz Lavi for dinner and overnight. Depart to Cana of Galilee, where Jesus performed his first public miracle: the turning of water into wine at the wedding feast. From Cana we will be traveling to Nazareth. Here in Nazareth we will visit the church of Annunciation, St. Joseph's workshop and Mary's well ("The spring of the Virgin Mary" is reputed to be located at the site where the Angel Gabriel appeared to Mary and announced that she would bear the Son of God). Continue on to Yardenit, the baptismal site along the Jordan river; You will Visit Beit She'an, a newly excavated city, and visit the Roman theater. Ancient Beit She'an is one of the most impressive Roman and Byzantine sites in Israel. Enjoy an evening ride along the the beautiful Jordan river, passing Jericho as well on our way to the golden city Jerusalem for dinner and overnight. On the morning we depart to the Mount of Olives for a panoramic view of the city. 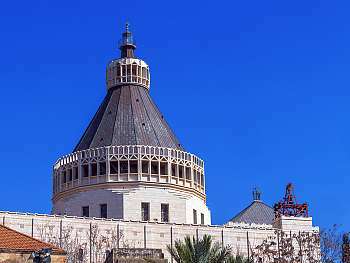 Visit the Church of all Nations, which is also known as the Basilica of the Agony, a Roman Catholic church located on the Mount of Olives in Jerusalem, next to the Garden of Gethsemane. It enshrines a section of bedrock where Jesus is said to have prayed before his arrest. View King David’s tomb and the room of the last supper on Mt. Zion. Enter within the walls of the ancient city and visit the Cardo, Temple Mount (entrance to the mosques not included), Western Wall, Via Dolorosa, the Church of the Holy Sepulchre. Explore the local oriental bazaar with its beautiful colorful little shops. Continue on to visit the Garden Tomb, considered by some Christians to be the site of the burial and resurrection of Jesus. Enjoy dinner and overnight in Jerusalem. 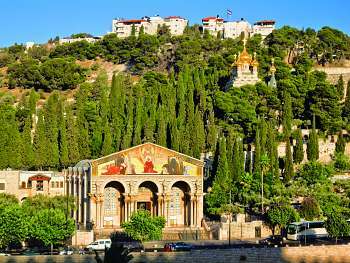 Drive to Ein Karem to visit the Church of the visitation; The Church of the Visitation honors the visit paid by Mary, Jesus’ mother, to Elizabeth, John the Baptist’s mother. This is the site where tradition tells us that Mary recited her song of praise, the Magnificat, one of the most ancient hymns to Mary. The church is beautifully adorned with tiled representations of that canticle in many of the worlds languages. Proceed to Yad Vashem, Israel’s official memorial to the Jewish victims of the Holocaust, established in 1953. Visit the Israel museum, the shrine of the book, where the dead sea scrolls are housed, and the amazing miniature model of Jerusalem showing an historical view as it was during the second temple period. 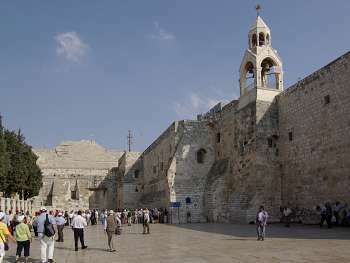 Visit the city of Bethlehem to view the Church of the Nativity. The church was originally commissioned in 327 AD by Constantine and his mother Helena over the site that is still traditionally considered to be located over the cave that marks the birthplace of Jesus of Nazareth. Conclude the day with dinner and overnight stay in Jerusalem. Morning departure to Qumran, the location where the dead sea scrolls where found in 1947 by a Bedouin boy. Visit the ancient city of Qumeran and drive along the shore of the dead sea, the lowest place on earth, to your next destination Masada, the last stronghold of the Jews after the destruction of the second temple in 70 A.D. Ascend 1500 feet to Masada by cable car and visit the food storeroom, water irrigation system and Herod’s palace. Descend by cable car. 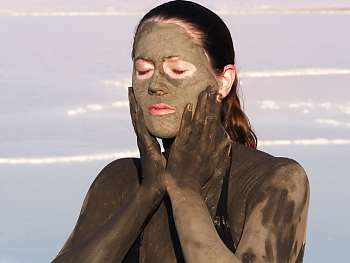 If Time and weather permits, you will have the opportunity to float in the Dead Sea and cover yourself with the mineral rich mud, believed to have therapeutic effects. Its surface and shores are 423 metres (1,388 ft) below sea level, Earth’s lowest elevation on land. Return to Jerusalem for Dinner and overnight stay. Travel south through the Negev desert and enjoy its stunning scenery. Visit Timna, see the copper mines and most striking and well-known rock formation in Timna Valley, Solomon’s Pillars. 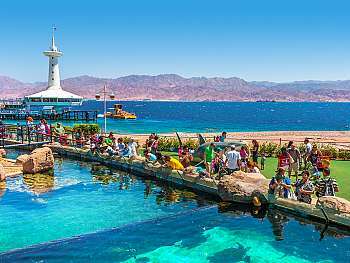 Continue to Eilat, Israel’s southernmost city, located on the Red Sea coast and stop at the underwater observatory, one of the largest sea Aquariums in the world, built into a coral reef. Enjoy Dinner and overnight in Eilat. If time permits stroll the interesting boardwalk along the beach and hotel areas and explore the local nightlife. After assisting you with your visa arrangements to Jordan, you will drive to Petra through desert highways. Your ultimate destination is the astonishing rose-red city of Petra which was built by the Nabateans (An early Arab tribe). Petra was renowned for its massive architecture, pools, dams and water channels. Petra is the legacy of the Nabateans who settled in the south of Jordan more than 2000 years ago. The visit begins with a possible short horseback-ride of about 700 meters until the entrance of the Siq, which is about 1.2 km long (walking distance). There is a possibility to rent a chariot (extra cost) to get inside Petra and back to the gate outside. Petra is famous for its huge monuments such as the treasury, royal tombs, the court, roman theater, roman street, Qasser El- Bint (Palace of Pharaoh’s daughter) and many other smaller monuments which fascinate the visitors. The city itself is almost 45 square km and is considered to be the second wonder of the world. On completion of this breathtaking visit you will be enjoying yourself with lunch in a nice Restaurant. After lunch drive back to border. Transfer to the border will be at around 18:00 p.m and cross back to Eilat. Dinner and overnight in Eilat. Morning departure of Eilat, on the way you will stop to gaze into the Ramon crater, a geological wonder. Proceed to Sde Boker and see Israels first prime minister, Ben Gurion’s hut and grave overlooking the magnificent Zin valley. Stop for a camel ride and experience life how it was in the desert in an authentic Bedouin tent. Learn about the customary Bedouin hospitality and enjoy a light authentic lunch. Continue to Hatzerim and visit Israel’s Air Force museum to view the planes and equipment where you will hear the story of this brave fighting force. Arive to TelAviv for dinner and overnight. After breakfast you will be transfered to the airport for your flight back home filled with memories that will last a lifetime and time to plan your next visit to the Holyland.